With all of the hats a business owner must wear, it's not always easy to know the best policies for the proper use of company credit cards by employees. Many business owners have the desire and need to create these policies but lack the direction on how to do it. 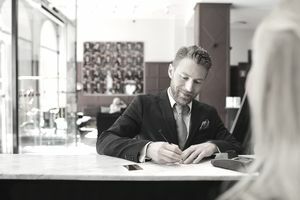 Both small- and large-sized businesses consistently try to minimize expenses related to traveling and other expenses incurred by employees for the benefit of the company. One of the best ways to cut down unnecessary employee expenses is by creating employee credit card usage policies. To reduce misuse of the company's credit card, this entails laying out rules and regulations concerning how the business credit card should be used. The following tips offer insight into how companies can effectively create employee credit card policies. If a company issues credit cards to its employees, it needs to implement a set of rules that govern the card's usage. The employees should be held responsible for the security of the card as well as the privacy of any information related to the company. The company needs to communicate credit spending limits, activities considered violations of use and repercussions for using the card inappropriately. Employees should ensure that the card is kept in a safe location, make sure the card account is free from fraudulent activities and the card's number is kept private. The company should also state that the business credit card is only to be used by the employee and not any other individual. The company should establish rules and guidelines that dictate activities or transactions where the credit card should be used. In most cases, the spending should be limited to the needs of specific employees for certain tasks or travels. Each department should have its own spending limits, and they should be added up and synchronized with the department's overall expense budget. As a company, it is good to inform each employee about the spending limits at the time of issuance. In addition, every employee should not exceed this limit and if one does, they must cover any over-the-limit fees. Lastly, the company's credit cards should never be used for cash advances. The company needs a process to hold employees responsible for the company credit card usage. At the end of each month, employees should submit a detailed report of all charges, receipts, and applicable accounting codes. Every employee should ensure that they attach the expenditure receipts to the monthly statement before submission to the company for verification purposes. All these need be done on time to avoid late payments. Doing so will ensure that the company monitors its monthly expenditures with ease and auditing becomes simpler. The company should be very strict on the usage of the employee credit card in that no one is allowed to use it for personal expenses. In short, the usage of the card should be limited to business-related activities. The definition of personal usage, in this case, is an expense not related to the operation of the business. The company should have specific consequences for any employee who uses the card for his or her own personal expenses. If a company issues employee credit cards, it is recommended to conduct a review of each employee's usage each month. The review of the card should be done by the employees' immediate supervisor together with a member of the company's accounting department. The supervisor of the employee should ensure that the usage of the card is limited to what it was meant for. Additionally, the accounting department should verify whether all the receipts and other expenditure documents submitted by the employee are authentic. Additionally, the company needs to have a policy for how to handle disputed charges, and staff assigned to handle cancellation of cards for terminated employees. Every company that uses corporate credit cards for their staff should have a clear, effective and detailed employee credit card policy to head off any misuse of the card by employees. It can avoid issues or misunderstandings and prevent bottlenecks in case an employee needs to incur work-related expenses and has no other payment method.